Peter Skelton Driving school will provide you with a driving instructor who will work hard to help you to become a safe driver and also to help you pass your driving test. 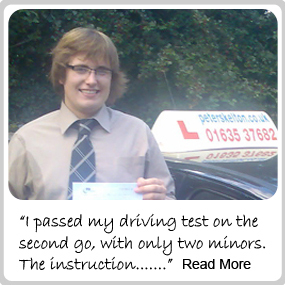 Driving lessons will be taken in and around Newbury at your own pace. Each pupil is an individual and we can not say how long it take to pass a driving test. We work around each pupils own learning style. Styles such as visual, audio, theoretical or practical. We all learn in different ways and all of our driving instructors are trained to teach in the style that’s appropriate to the pupil. Pupils are provided with training material consisting of text and diagrams on the trickier aspects of driving such as roundabouts and crossroads. We even have diagrams for the trickier parts of Newbury such as the Sainsburys and Robinhood roundabouts. Manoeuvres often cause a great deal of concern for pupils. The training material allows the pupil to study the diagrams in their own time and go hand in hand with the lessons. The diagrams can also be of benefit with private practice and can help to speed up the time taken to test. I have found that pupils who take the time to learn and to do their homework, progress much quicker than those who do not. Why pay your instructor a small fortune to continually teach you the same thing until you get it right when you can learn the theory of it in your own “free” time. For example, almost all instructors have a method for the parallel park. Once you have been taught that method, you can then use the diagrams provided to learn the method in theory. Therefore the next time we practice the parallel park, it will be so much easier to do. What we then work on is the physical control to do the manoeuvre accurately and safely. So when you are taking your lessons with your driving instructor around Newbury and the surrounding areas then you can rest assured that you will recieve the best tuition possible.